With pay-TV subscription numbers dropping as people turn to online sources for their entertainment and news, it might seem sensidble that the pay-TV giants would jump into the streaming video business. But with the exception of Dish-owned Sling TV, that hasn’t been the case. That might be because consumers appear to be quite fickle about their use of these standalone services. 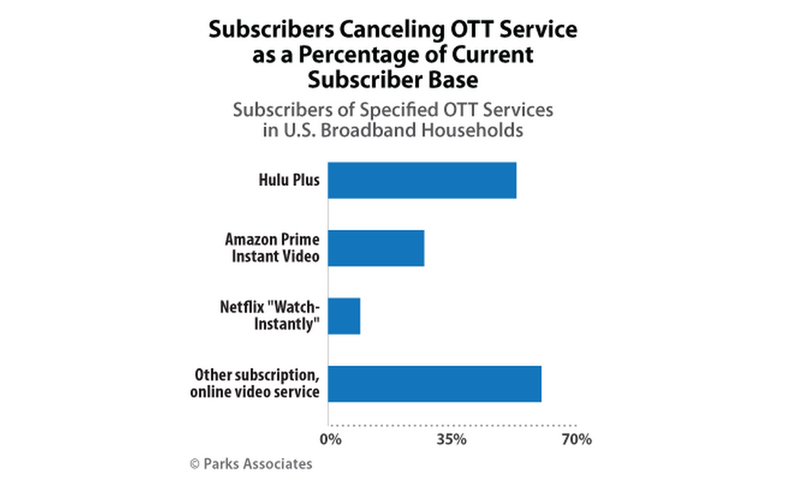 A recent report from Parks Associates finds a significant level of customer turnover for most streaming, or over the top [OTT], services. Netflix, which has the highest level of customer loyalty in the group, still saw about 9% of its customers cancel in the last year, according to Parks. The turnover at Amazon Prime cancellations was much higher, at around 30%. Meanwhile, the churn for Hulu’s premium tier (formerly called Hulu Plus) was about half the customer base. For the smaller services, the turnover rate is up around 60% as customers dip their toes in and out. “The high churn rate for many of these services suggests that consumers are holding onto their Netflix account while experimenting with the wide variety of other video subscription options,” said Brett Sappington, Director, Research, Parks Associates. Thus, pay-TV providers — many of whom have little or no competition in their local markets and who often lock new customers in with multiyear contracts — may be reluctant to get into a business where they are constantly having to chase new subscribers to replace defecting ones. It’s easier for cable operators to focus on retaining their broadband customers who need Internet connections to access Netflix and the others. Comcast recently announced a standalone streaming service, cleverly dubbed “Stream,” but unlike Sling TV — which provides live online access to around 20 cable channels — Stream is effectively HBO Now with an assortment of freely available over-the-air stations. Additionally, Stream is only available to Comcast broadband subscribers and only people who live within the company’s cable footprint.